The silver miner took advantage of the market to position itself for future growth. Image source: First Majestic Silver Corp. 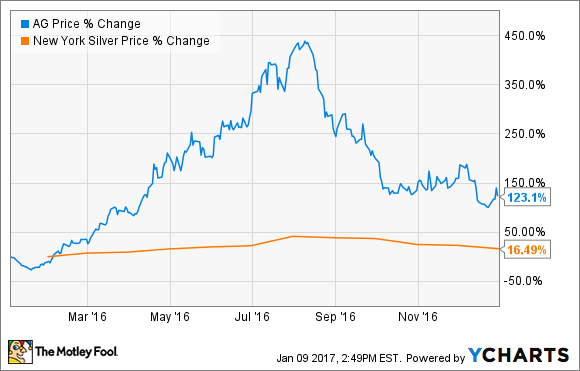 While the rising price of silver drove much of those gains, First Majestic did not sit by and idly watch from the sidelines. Instead, the company acted to take advantage of the situation, which put it in the position to accelerate future growth. With its stock price surging, First Majestic announced a private bought deal financing in late April. This transaction would allow it to raise cash so it could accelerate the development of several growth projects. Initially, the company sought to raise 50 million Canadian dollars. However, it was able to pull in CA$57.5 million via this equity financing. That capital boosted the company's cash position up to $108.2 million at the end of the second quarter. First Majestic was one of many precious metals miners that tapped the capital markets for cash last year amid an improving silver market. Fellow silver-focused miner Coeur Mining (NYSE:CDE), for example, completed an at-the-market offering over the course of the year raising a total of $200 million. Coeur Mining used that cash to redeem $190 million of its 7.875% senior notes due in 2021. As a result of this and other debt repayments, Coeur Mining's net debt declined more than 60% since the third quarter of 2015, saving the company an estimated $29 million of annual cash interest expenses. While Coeur Mining's cash infusion strengthened its balance sheet, that was not a need at First Majestic because of its minimal debt. In fact, as of the end of last quarter, First Majestic had $122.5 million in cash against just $34.6 million in debt. Instead, the company put some of its excess cash to work by increasing capex spending. Overall, the company boosted its 2016 capex budget by $20.9 million to increase planned development spending 51% and exploration spending 71%. It earmarked $5.7 million of that incremental capital for the construction of a roasting plant at La Encantada, which should be complete later this year, enabling the recovery of an additional 1.5 million ounces of silver from the reprocessing of above-ground tailings. Meanwhile, $3.7 million of capital will go to La Guitarra to buy and rehabilitate underground equipment for an upcoming expansion. Finally, the company approved $2.6 million in spending at Plomosas, which is the first investment since it acquired the mine in 2012, enabling it to begin a 5,000-meter underground diamond drilling exploration program. These investments, according to comments by CEO Keith Neumeyer, planted "the seeds for our next leg of growth." Those seeds are eventually expected to grow production to as much as 20 million ounces of silver over the next three to five years according to the company. That's nearly double the 10.7 million to 11.9 million ounces of silver it expects to produce this year. With a pristine balance sheet, backed by more than $100 million of cash, First Majestic Silver certainly has the financial resources to get started on meeting that ambitious growth target. First Majestic Silver pounced at the chance to raise capital as its stock began soaring last year. That move enabled it to accelerate growth-focused spending and start planting the seeds of a major growth phase. These actions could see the company hit its output target of 20 million ounces much quicker than initially anticipated.